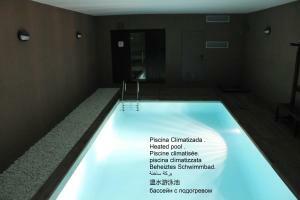 Located in the heart of Barcelona, just 600 metres from Urgell Metro Station, Casanova Suites offers an indoor pool. Passeig de Gràcia is 1 km away. This modern apartment features a private rooftop terrace and stylish décor. It comes with 1 double room and 1 bathroom with a bath, free toiletries and a hairdryer. Bed linen and towels are provided. The living room includes a sofa bed, flat-screen satellite TV and dining area. The kitchenette is equipped with microwave, dishwasher, Nespresso coffee machine and electric kettle. There is free WiFi and wired internet access. There are many restaurants, cafes and shops in the surrounding streets. Hospital Clinic Metro Station is 10 minutes’ walk from Casanova Suites and a 20-minute metro ride will take you to Gaudi’s Sagrada Familia. Plaça Catalunya, with direct buses to El Prat Barcelona Airport, is 15 minutes' walk away. Rate: € 84.00 ... € 200.00; select dates below to get current rates. Rate: € 120.67 ... € 160.00; select dates below to get current rates.